Well, I was game, and why not? I’ve shelled out hard cash to see all the other Star Trek movies, regardless of how disappointing they were. In fact, I had come to expect disappointment. 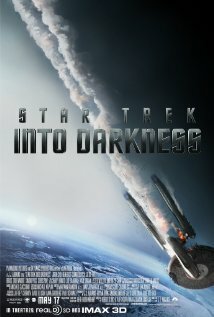 But here I had been fooled by the earlier Star Trek prequel, which, as far as Star Trek movies goes, was not half bad. A Taiwanese colleague had intimated to me that this, the sequel to that prequel was “even better” than its predecessor, and so it was inevitable that I once again tendered my hard earned dough for the hope of being, if not particularly enlightened, at least entertained. I was heartily disappointed in all respects. I can hardly blame my colleague for misguiding me. There’s just a cultural gap. The Star Trek television series/concept for Americans is a transcendent signifier. The show itself only ran three seasons, but because of strong writing and memorable characterizations was etched onto the American mindscape as it replays endlessly in syndication to the point that finally just about every American rich enough to afford a television set has seen every episode of the original series as many times as his or her mind will allow. And this was well before the seemingly endlessly spin-offs began: Star Trek: The Next Generation, Deep Space Nine, Star Trek Voyager and many imitators lacking official sanction from the United Federation of Planets but which either maintained or held in willful abeyance the rules of interstellar space travel as laid down by Gene Rodenberry, creator and sometime-writer of the original Star Trek show. Because of this cultural gap in Star Trek expectations, I felt myself noticing what probably few of the theater-goers extending around me on all sides. As far as plotlines, who can remember what the dire emergency was that rocketed the crew once through space. But now, if I may be given the right to talk about something that does not exist, time has progressed in the movie. Kirk is now a captain. Some of other cast/crew members show some character development but Kirk plays this chapter of Tiberius’s career as essentially the same as the first outing. And so I saw this callow youth the young Kirk as being unfit for even lying the funeral pyre of his progenitor. And this was weird, because I have always seen Shatner as the scenery-chewing over-actor portrayed in American culture when he was lampooned on John Bulushi on Saturday Night Live. Shatner played on some guest role on virtually every television show that came along in the late fiftes and early sixties. Sometimes he hit it; sometimjes he overdid it. But the charcters he played were usually of sufficient interest to encourage one to suspend ones disbelief just a little. I have heard Shatner’s first album and would never suggest that anyone listen to it, especially if they have taken hallucinogenic drugs. Later, on another Saturday Night Live, Shatner played that he was answering questions at one of these ubiquitous Star Trek conventions which to an American we know what it is but not so much so because why in Taiwanese culture? That when he delivered his warning to Trekkies, “Move out of your mother’s basement and GET A LIFE.” This seemed to bring things round; Shatner’s meta-acting propelled him to icon status that seems a huge, playful statue of itself. And we Americans know, too, that Kirk was, this ultimate hero because he played to the six year old in all of us. He played badly but boldly. One never questioned that he should be captain. Spock might be more intelligent, for example—but one would not want to him be captain because to be captain requires an incredibly flexible way of encountering the world. The Kirk of the TV show, Shatner’s Kirk had this center that he was really captain, that he’d encountered an virtual infinitude of cultures, customs, ethical systems. And because of that he had a sense of humor, in spite of Daniel Webster antics as a speechifier. How could this Taiwanese audience know anything of the weird phenomenon of William Shatner, that is, in the in-joke level. That he is the ultimate postmodern synthetic icon always phony never dying but writing book and every series he’s been in the top 10. The toupee, the toupee! Can’t they see. And then so fat as not even to be able to fit into his already a little too form-fitting uniform. That Shatner was America. It’s not talent it’s chutzpah that counts. Like Citizen Kane. I mean it is the same genius because there is nothing special about any of it; it is there for us all to lie our way to the very top. Anyway there’s some anatonomical part which the new Kirk is just lacking, something this probably technical superior actor to Shatner (who isn’t) nevertheless can never live up to—not in our wildest reruns—or ever have the chance too, since he spends most of his time just getting chased around the universe. One got the feeling Tiberius would have had a few of the local beverages, gambled at a card-game he offered to teach the locals, and was not beyond a perhaps interpecies encounter or two. One had to respect that. And it was in spite of Shatner but also because of him that the television show’s writing took over—unlike in the recent movie—and so somehow art won out over artifice. We could construct a more believable world from the fictional information. Shatner is total phony, yes, but Odysseus nevertheless. The Star Trek prequel-sequel forgets that the success of the television Star Trek was based on character. The action usually amounts to the Enterprise hanging helplessly in Space while Scotty tries to fix—whatever needs fixing. It is interesting how television shows when they become movies lose their close connection with us. That moment by moment that the Enterprise might blow. They are no longer lodgers in our dwellings. They have returned to the money factory. Kurt Cline has been a poet and performance artist for the past thirty years. His poems have won awards and appeared in numerous small-press magazines in America, Europe and Asia, and his performances have garnered media attention and many positive reviews. His full length poetry collection Voyage to the Sun: Poetry and Translations was published by Boston Poet Press in 2008. Cline’s folk-punk CD, Alien Shoe came out from 12 Studio in Taiwan in 2013. He is currently Associate Professor of English and Comparative Literature at National Taipei University of Technology. Scholarly articles have appeared in Anthropology of Consciousness; Tamkang Review, Glimpse: Phenomenology and Media; Cuadrante and Communication, Comparative Civilizations and Cultures: Journal of the Jean Gebser Society.